AWST International: Rhodium Necklaces, Sterling Silver Necklaces, Rhinestone Earrings! 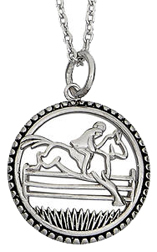 • Sterling Silver Necklace RUNNING HORSE #JN631: Sterling Silver Running Horse Pendant is 1" x 1/2" and comes gift boxed. Great gift idea! ORDER NOW! • Sterling Silver Necklace JUMPER & RIDER #JN9356: Sterling Silver Jumping Horse with Rider Pendant comes with 18 inch stainless steel Necklace. Great gift idea! ORDER NOW! • Sterling Silver Round Pendant HORSE HEAD #JN9332: Sterling Silver Round Horse Head Pendant with 16 inch Rhodium chain. Lobster claw closure. ORDER NOW! 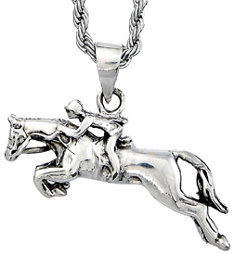 • Sterling SIlver Necklace JUMPING HORSE #JN633: Sterling Silver Necklace with Jumping Horse Pendant. 16 inch Chain with 2 inch extension and lobster claw closure. ORDER NOW! Precious Pony Necklace: This shimmering galloping pony necklace features dazzling pink/blue/clear stone accents that will certainly demonstrate your glamorous look! "Lead Safe" silver-plated Horseshoe Necklaces. Necklaces have 16 inch Chain with 2 inch adjustment. Gift boxed in colorful, velour horse head box. Trendy and modern, this beautiful Precious Pony Necklace will distinctly mark your style. 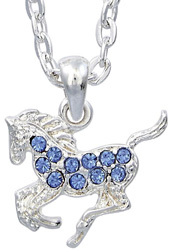 • Precious Pony Necklace BLUE #JN896BL: Great gift idea! 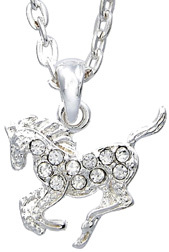 • Precious Pony Necklace CLEAR #JN896CL: Great gift idea! ORDER NOW! Horseshoe Necklace: Add glamour to your attire with this “Lead Safe” silver-plated Horseshoe Necklace with rhinestone encrusted fun horseshoe charm. This chic Fashion Horseshoe necklace adds style to any of your collection. It has a bright, 5/8" Horseshoe Charm embellished with rhinestones to present a sparkle, making it an everyday necklace suitable for any event! 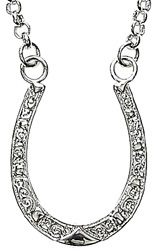 Horseshoe charm dangles from a 16 inch ball bearing style chain with a 2" adjustment. Comes with a lobster claw clasp. Own it today for yourself or present it for the someone special. 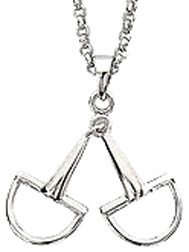 • Horseshoe Necklace CLEAR #JN898CL: Great gift idea! ORDER NOW! • Horseshoe Necklace BLUE #JN898BL: Great gift idea! ORDER NOW! 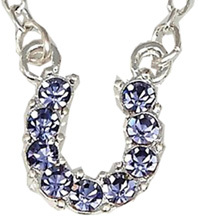 • Horseshoe Necklace PURPLE #JN898PU: Great gift idea! ORDER NOW! • Horseshoe Necklace MULTI #JN898MU: Great gift idea! ORDER NOW! 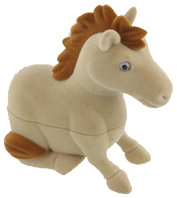 Great for horse lovers, equestrian gifts or horse gifts! 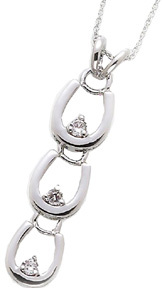 • Sterling Silver Necklace SNAFFLE BIT #JN628: Sterling silver snaffle bit necklace. 16" sterling chain, 3/4" pendant. ORDER NOW! 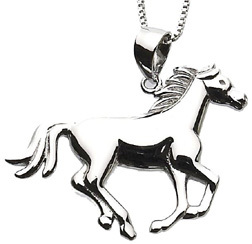 • Sterling Silver Necklace HORSE HEAD #JN626: Sterling silver horse head necklace. 16" sterling chain, 3/8" pendant. ORDER NOW! • Etched Rhodium Plated Necklace HORSESHOE #JN5009: Rhodium plated etched Horseshoe Necklace with 15.5 inch Chain. ORDER NOW! • Rhodium & CZ Necklace HORSE SHOE #JN1678: Rhodium and CZ Horseshoe Necklace is 1/2" x 7/8" and is Rhodium-plated. ORDER NOW! 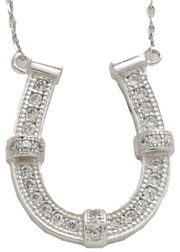 • Three Rhodium and CZ Necklace HORSESHOE #JN6781: Rhodium-plated horseshoe necklace. Pendant is 1.5" long. ORDER NOW! • Rhodium Necklace BLACK ENAMEL CZ HORSESHOE #JN7696: Fashionable Cubic make this spectacular pendant a sparkling sensation. Sweet and feminine, the black enamel leaves a gorgeous shimmer. Rhodium-Plated Necklace features an 18" Chain and is gift boxed for your convenience. ORDER NOW! 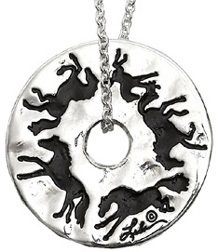 • Pendant Necklace SILVER HORSE #JN5013: Silver tone Horse Pendant on black cord Necklace. ORDER NOW! 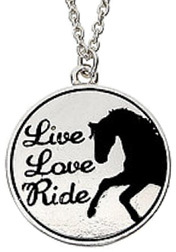 • Necklace Live, Love, Ride #JN118: "Live, Love, Ride," Necklace. Chain is 18" with 2" adjustment. ORDER NOW! 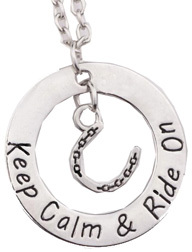 • Necklace Keep Calm & Ride On #JN120: Silver Tone "Keep Calm & Ride On" Necklace. ORDER NOW! • Lila Extented Trot Cord Necklace COPPER TONE #JN116C: 34 inch Brown Suede cord Necklace with "Lila" Extended Trot Horse Pendant. Copper-tone with 1.5 inch Charm. ORDER NOW! • Lila Extented Trot Cord Necklace SILVER TONE #JN116S: 34 inch Black Suede cord Necklace with "Lila" Extended Trot Horse Pendant. Silver-tone with 1.5 inch Charm. ORDER NOW! • "Lila" Two Sided Necklace Inspirational Word LOVE, JOY, FUN #JN114: "Lila" Words of Inspiration Two Sided Necklace "Love, Joy, Fun". 18 inch Chain with 2 inch Adjustment. ORDER NOW! 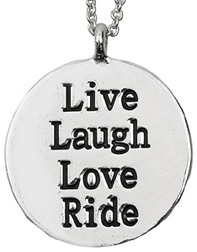 • "Lila" Two Sided Necklace Inspirational Word LIVE, LAUGH, LOVE, RIDE #JN112: "Lila" Words of Inspiration Two Sided Necklace "Live, Laugh, Love, Ride". 18 inch Chain with 2 inch Adjustment. ORDER NOW! 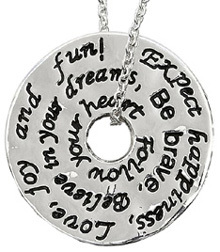 • "Lila" Two Sided Necklace Inspirational Word BELIEVE #JN113: "Lila" Words of Inspiration Two Sided Necklace "Believe" with two accent charms. 18 inch Chain with 2 inch Adjustment. ORDER NOW! 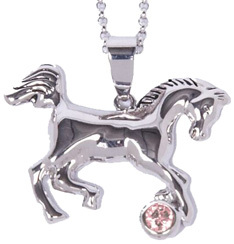 • Rhodium-Plated Horse Necklace PINK STONE #JN634PK: Rhodium-plated Necklace with 1 inch Horse Pendant and Pink Stone. ORDER NOW! • Rhodium-Plated Horse Necklace CLEAR STONE #JN634CK: Rhodium-plated Necklace with 1 inch Horse Pendant and Clear Stone. ORDER NOW! 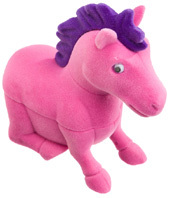 • Pony Pendant with Pony Gift Box PINK #JN109: Kids will love this Pink Pony Pendant Necklace displayed in a Pony-shaped, velour keepsake box! 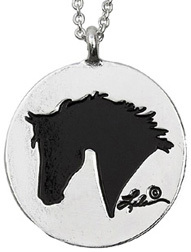 The beautiful Pony hangs on a 1 inch Silver-Tone Chain with a 2 inch extender with a sterling silver gloss. ORDER NOW! • Pony Pendant with Pony Gift Box IVORY #JN110: Children will adore this Ivory Pony Pendant Necklace presented in a Pony-shaped, velour keepsake box! 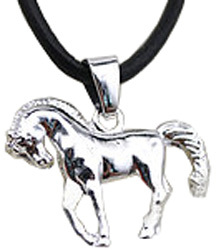 The lovely Pony hangs on a 1 inch Silver-Tone Chain with a 2 inch extender with a sterling silver finish. ORDER NOW! 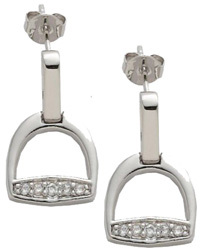 • Sterling Silver & CZ Earrings HORSE SHOE #JE127: Sterling Silver Horse Head Earrings. ORDER NOW! 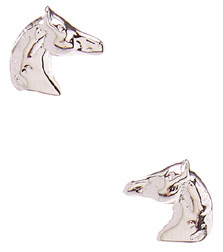 • Sterling Silver Earrings HORSE HEAD #JE126: Sterling Silver Horse Head Earrings. 0.25'' x 0.13''. ORDER NOW! 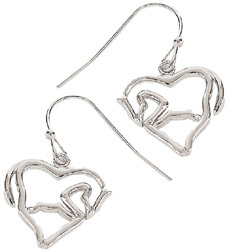 • Sterling Silver Earrings HORSE HEAD HEART #JE863: Sterling silver horse head heart earrings, 8 mm x 7 mm. ORDER NOW! • Kid's Sterling Silver Earrings HORSE HEAD #JE528: Kid's size sterling silver horse head earrings, 8 mm X 8 mm.. ORDER NOW! 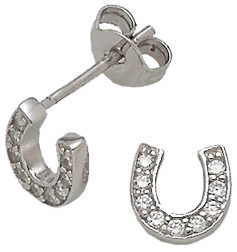 • Sterling Silver Horseshoe Post Earrings SMALL #JE0315CL: Small sterling silver horseshoe post earrings with CZ. ORDER NOW! 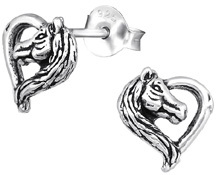 • Sterling Silver Horseshoe Post Earrings MINI #JE1231: Mini sterling silver horseshoe post earrings. ORDER NOW! 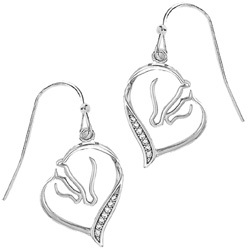 • Rhodium Earrings MARE & FOAL#JE650CL: Mare and Foal Rhodium fish hook earrings with clear stones. ORDER NOW! 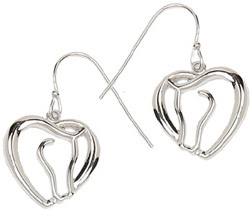 • Heart Earrings HORSE BODY #JE6813: Rhodium-plated Horse Body and Heart Earrings. ORDER NOW! 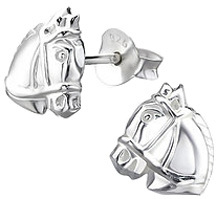 • Heart Earrings HORSE HEAD #JE6801: Rhodium-plated Horse Head and Heart Earrings. ORDER NOW! 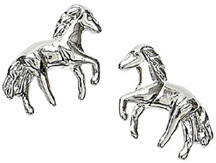 • Sterling Silver Earrings FOAL MINI #JE115: Mini Sterling Silver Foal Earrings. 1/4 inch. ORDER NOW! 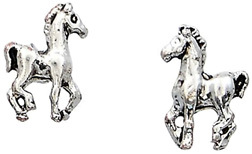 • Sterling Silver Earrings HORSE MINI #JE120: Sterling Silver Mini Horse Post Earrings. ½ inch. ORDER NOW! 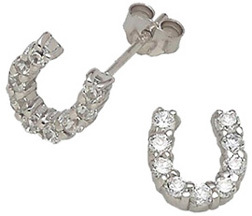 • Rhodium Post Earrings CZ STIRRUP #JE2035: Rhodium Post Stirrup Earrings with CZ. ORDER NOW! • Rhodium Post Earrings BLACK ENAMEL & CZ HORSESHOE #JE7696: Transform your look with the Rhodium Black Enamel Cubic Zirconia Horseshoe Earring. This beautiful Horseshoe post earrings are inlaid with Cubic Zirconia that contrast against the black enamel for stylish radiance. These enamel horseshoe studs can be worn in any occasion. They can put a dash of color to a black attire, or be worn to highlight lighter attire in a variety of styles. ORDER NOW! • Three Sterling Silver Earrings Set #JE2846: Set of Three Sterling Silver Post Earrings. Horseshoe, Horse Head, and Horse Body. ORDER NOW! 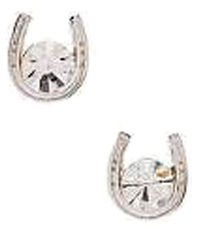 Horseshoe Earrings Set: Add chic and flair to your attire wherever you go with this stunning silver plated Horseshoe Rhinestone Earring jewelry Set. The earrings will fit comfortably with the wearer's ears. A stud push back closure offers maximum functionality. Earrings are for pierced ears only. This set is a blend of traditional western design, a select modern fashion, and superior quality that makes this set a awesome gift for any lover of equestrian jewelry. Lead safe. 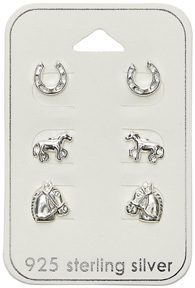 Each Horseshoe Earrings Set comes packaged in a color coordinated velour horse head gift box. • Horseshoe Earrings PINK #JE898PK: Pink Rhinestones / Silver plated. ORDER NOW! 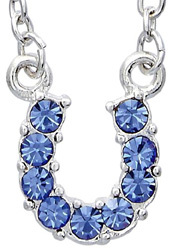 • Horseshoe Earrings BLUE #JE898PK: Blue Rhinestones / Silver plated. ORDER NOW! 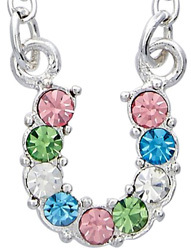 • Horseshoe Earrings MULTI #JE898MU: Multi Colored Rhinestones / Silver plated. ORDER NOW! 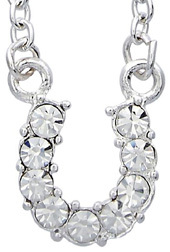 • Horseshoe Earrings CLEAR #JE898CL: Clear Rhinestones / Silver plated. ORDER NOW!